Sidney's Zane Snider competes in shot jump during a dual meet against Piqua on Tuesday in Sidney. Sidney's Bryce Doyle competes in the high jump during a dual meet against Piqua on Tuesday in Sidney. Sidney's Josiah Hudgins crosses the finish line during the 100 meter dash during a dual meet against Piqua on Tuesday in Sidney. Sidney's Ashaiah Moton runs the 100 meter dash during a dual meet against Piqua on Tuesday in Sidney. Carter Elsner, left, takes the baton from Tyler Murphy in the 4x200 meter relay during a dual meet against Piqua on Tuesday in Sidney. 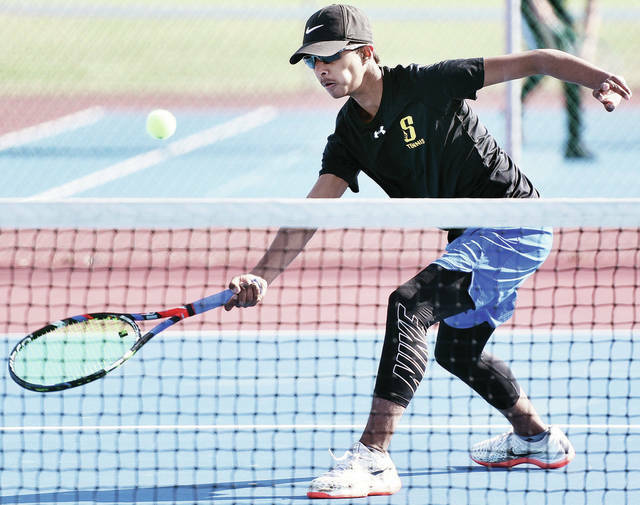 Sidney’s Akansh Mani plays in third singles against Northmont’s during a nonconference match on Wednesday in Sidney. Mani won 6-0, 6-1. Sidney's Grant Hoying plays Northmont's Trent Maas in second singles during a nonconference match on Wednesday in Sidney. Hoying won 6-1, 6-1. Sidney’s Ava Parin competes in high jump during a dual meet against Piqua on Tuesday in Sidney. Perin finished first by clearing 4-6. 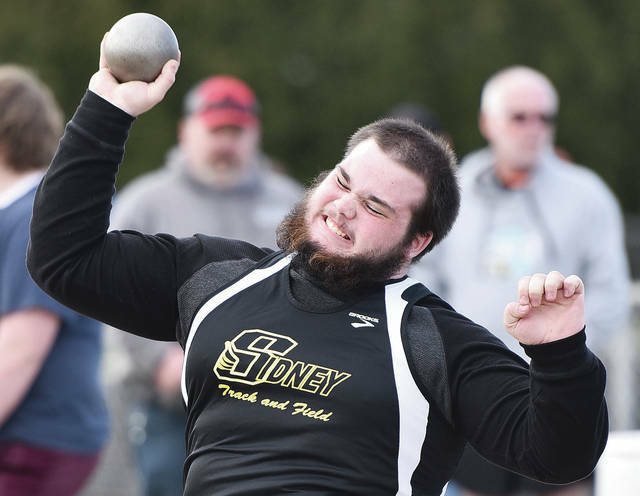 SIDNEY — Sidney’s boys track and field squad beat Piqua while its girls squad lost in a dual meet on Wednesday in Sidney. The boys squad finished first with 73 points while Piqua was second with 64. Piqua’s girls were first with 89 points while Sidney had 47. 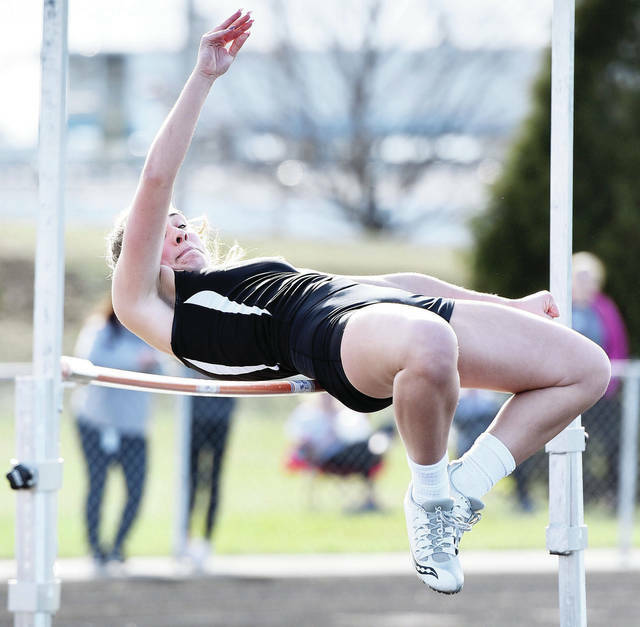 In both boys and girls, Piqua largely dominated track events and Sidney largely dominated field events. Josiah Hudgins finished first in the 100-meter dash with 11.46. 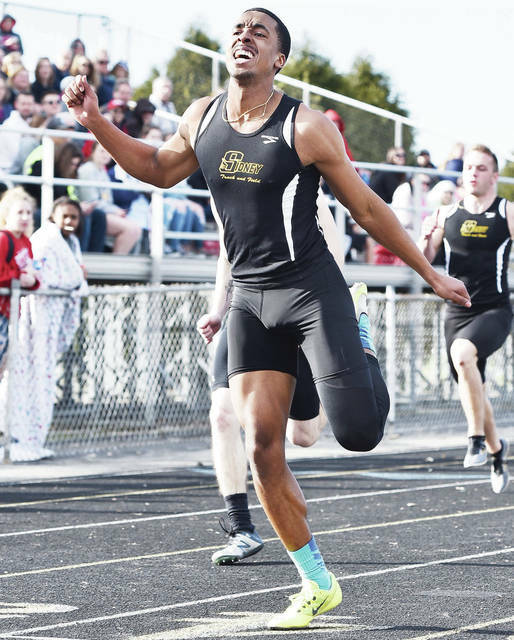 Hudgins was also a part of Sidney’s boys 400 relay, which won in 45.53. Curtis Spangler won the 400 dash in 55.59. Spangler was a part of the 1,600 relay, which won in 3:54.87. Spangler was first in high jump with 5-6. Hudgins was first in long jump with 20-9.5. Shad Swiger won discus with a throw of 88-10. Jaden Swiger won shot put with a throw of 40-0. The Yellow Jackets girls won the 400 relay in 56.59, beating out the Indians by .1 seconds. Cassidy Truesdale won the 300 hurdles in 54.41. Ava Perin was first in high jump with 4-6. Zoe Overholser won long jump with 13-3. Emma Wiford on discus with a throw of 109-8 and shot put with a throw of 33-1. The dual is a part of the Piqua vs. Sidney all-sports trophy competition, which features head-to-head matchups between teams of the two schools in all sports. The all-sports trophy winner is determined by a points system. In sports where Piqua and Sidney teams play once a season, one point is awarded. In sports where teams play twice, .5 points are awarded. Sidney secured the all-sports trophy for the second consecutive year during winter sports season. The Yellow Jackets lead Piqua 12.5-6.5. The first school to 11.5 points secures the competition. The Cavaliers bounced back from a run-rule loss to Marion Elgin on Tuesday by defeating Miami East in nonconference play on Wednesday. Lehman scored one run in the each of the first and second innings and took a 3-1 lead after the fourth. The Cavaliers then scored two in the fifth and three in the sixth to pull away. Seth Roe pitched a complete game and picked up the win. He struck out 10 batters and walked three while allowing two earned runs on seven hits. Jacob Trent had two hits (including a home run) and had 2 RBIs. RJ Bertini had two hits and 3 RBIs, Drew Barhorst had two hits (including a double) and Bryce Kennedy had two hits. The Pirates earned a run-rule win in five innings in a makeup Northwest Central Conference game on Wednesday in De Graff. They trailed 6-3 in the middle of the fourth but scored 10 in the fourth and three in the fifth to end it. Riverside had 16 hits and three errors while Hardin Northern had four hits and five errors. Levi Godwin was 3 for 4 for Riverside with 2 RBIs and two runs while Kale Long was 3 for 3 with 1 RBI and two runs. RJ McGowan and Zane Rose were both 2 for 3 with 2 RBIs and Deven Frilling was 2 for 4 with 3 RBIs. Brody Rhoads had a triple while Rose had two doubles and Godwin had one double. Rose picked up the win on the mound. He allowed two earned runs on three hits in two innings and had one strikeout. Heidi Aselage drove in the winning run on a single in the top of the eighth inning to help the Yellow Jackets win a nonconference game on Wednesday in Beavercreek. Sidney trailed 5-4 heading into the seventh but scored one run to force extra innings. Lauren Barker picked up the win in the circle. She had four strikeouts and one walk. Madison Osborne was 2 for 3 and scored two runs. Allie Milanese was 2 for 4 with 2 RBIs and Hallie Westerbeck was 2 for 4 with 1 RBI and one stolen base. Nadia Stephens hit a home run and had two stolen bases and Allie Herrick doubled. The Cavaliers earned a run-rule win in five innings in a Northwest Central Conference makeup game on Wednesday at Waynesfield-Goshen. The Cavaliers took control with five runs in the second inning, then scored 13 in the fourth to boost their lead to 21-2. Madalyn Kirtley had seven strikeouts and didn’t give up a walk in five innings. She had a single and a double at the plate. Anna Cianciolo had two hits and Grace Monnin hit a double and a grand-slam home run. Monnin finished with 7 RBIs. Jalynn Stanley pitched a perfect game to lead the Pirates to an NWCC victory over Hardin Northern in an NWCC makeup game on Wednesday in De Graff. It’s the first of Stanley’s career. She had two strikeouts in seven innings. “She mixed her pitches and got a lot of ground balls and pop ups tonight to keep them off the bases,” Riverside coach Andy Phelps said. Stanley had a good night at the plate as well. She was 3 for 4 (including a home run) with 2 RBIs. Kalin Kreglow also homered and Leah Kelsey was 2 for 3 with 1 RBI. The Pirates had nine hits and no errors while Hardin Northern had three errors. 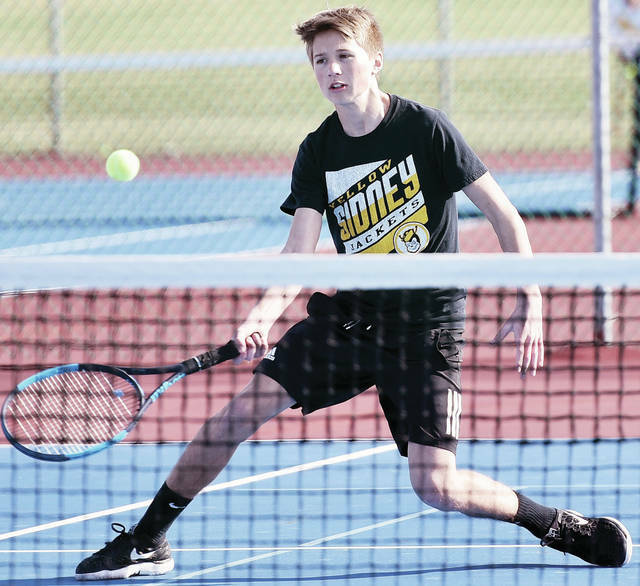 Prem Dev pulled out a three-set win in first singles to secure a 3-2 nonconference win on Wednesday in Sidney. Dev’s first singles match was the last to finish. He won 2-6, 6-1, 6-2. Grant Hoying won at second singles 6-1, 6-1 and Akansh Mani won 6-0, 6-1 at third singles. TJ Leonard and Broc Bey lost 6-4, 6-2 at first doubles and Jersain Brux and Kazuma Okada lost 6-2, 7-5 at second doubles. Sidney’s Zane Snider competes in shot jump during a dual meet against Piqua on Tuesday in Sidney. 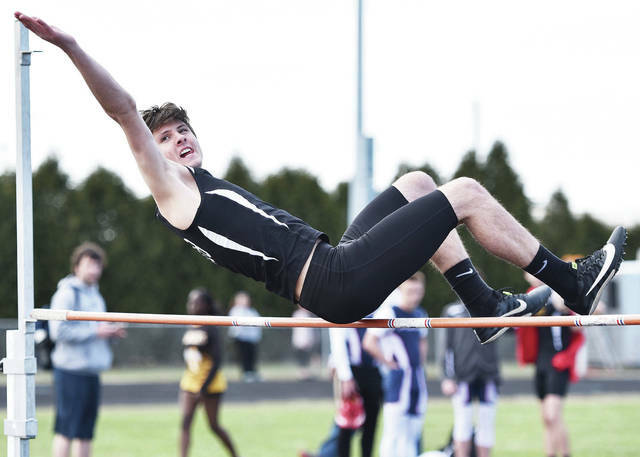 Sidney’s Bryce Doyle competes in the high jump during a dual meet against Piqua on Tuesday in Sidney. Sidney’s Josiah Hudgins crosses the finish line during the 100 meter dash during a dual meet against Piqua on Tuesday in Sidney. 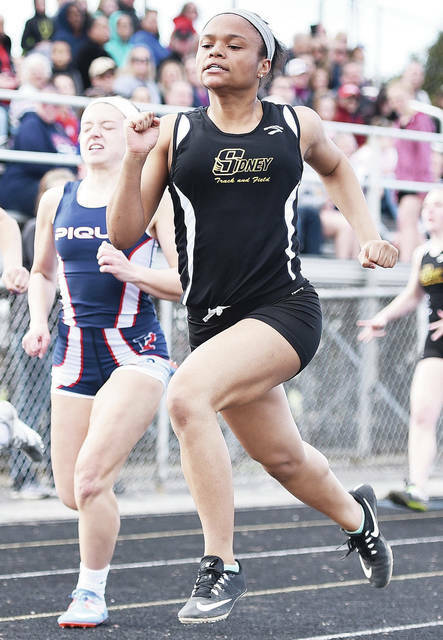 Sidney’s Ashaiah Moton runs the 100 meter dash during a dual meet against Piqua on Tuesday in Sidney. 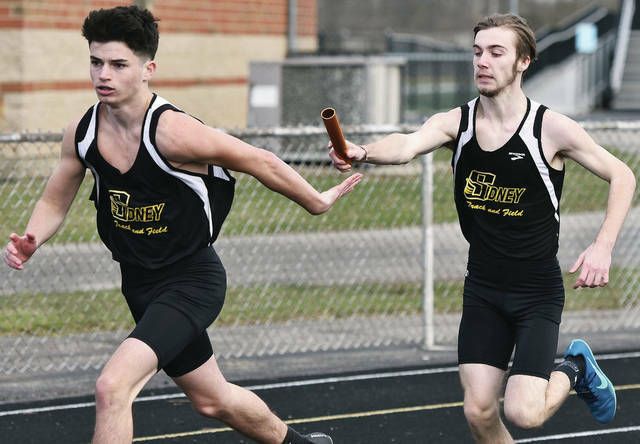 Carter Elsner, left, takes the baton from Tyler Murphy in the 4×200 meter relay during a dual meet against Piqua on Tuesday in Sidney. Sidney’s Grant Hoying plays Northmont’s Trent Maas in second singles during a nonconference match on Wednesday in Sidney. Hoying won 6-1, 6-1.